A portion of the proceeds benefits the Surry Senior Center! Kids 12 & under FREE with paid adult! Free admission - seating very limited. Donations accepted for the library! It’s November 1843, and in the London study of Charles Dickens, writer’s block has struck! His annual Christmas story is due in a matter of days, and the famed author is struggling. He wants to tell the story of the poor and desperate in the city, but for the first time in his illustrious career, words fail him! Enter Margaret and Elizabeth, two of Dickens’ adolescent nieces. The girls have come to London for a week’s visit with their beloved Uncle Charlie and Aunt Catherine. The aspiring young writers learn of their uncle’s plight and hatch a plan to help him write his story. As the trio of scribes collaborates, the classic tale that we know as “A Christmas Carol” comes to life in Dickens’ study. The familiar characters enter and exit and the writers move in and out of the scenes, making subtle changes and crafting the world’s most famous ghost story. 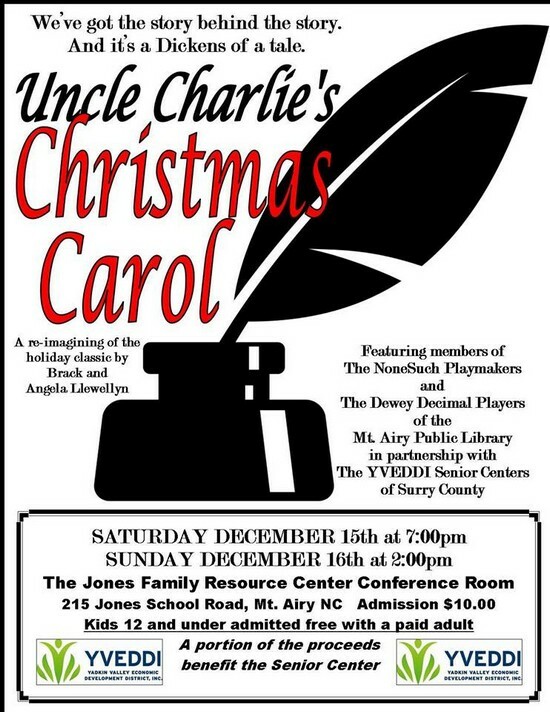 It’s “A Christmas Carol” as you’ve never seen it before! Ghost of Christmas Yet-to-Come: Mystery? 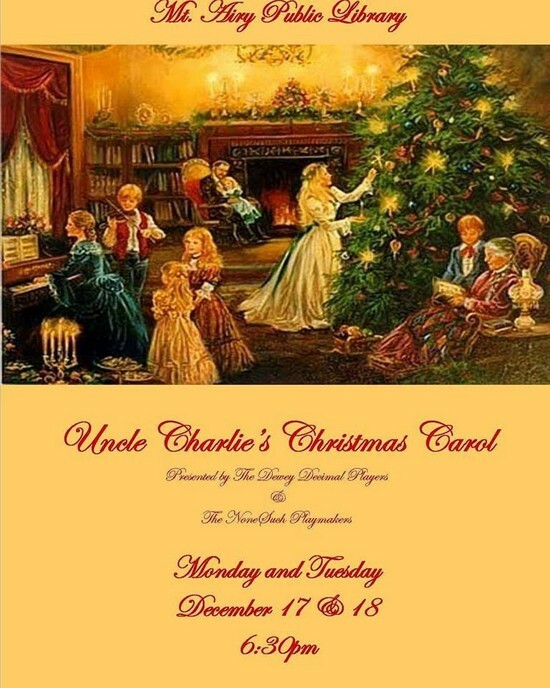 Based on the story by Charles Dickens, "A Christmas Carol" this production brings together The NoneSuch Playmakers and the Mt. Airy Public Library's Dewey Decimal Players.